It was movie / date night last evening. Shep did not approved. There is a shortage of good films out there, though somehow the church of Scientology got the folks at Rotten Tomatoes to give the new Mission: Impossible (and it seems it is always 'possible, btw) a 97%. We upped it by 3% to see the 100% rated the Cakemaker. We saw the review during our last movie, along with a few others we would like to see. The problem - even in the art movie world - is that a film in German, Hebrew and English don't tend to stick around more than a week.........if they are shown at all. 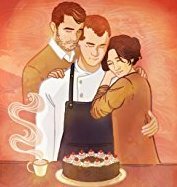 It's not a spoiler to tell you the premise: a German baker falls in love with a married Israeli guy who travels monthly to Berlin. After the Israeli guy dies in an accident, the German dude travels to Jerusalem and ingrains himself in the widow's life. Facebook would say: It's complicated. Thomas, the German guy, is the movie's center, the only one with feet in both worlds. While the widow mourns her husband, you don't get to see Thomas do the same. I found it a unique story of love on multiple levels. I thought the filmmaker flowed flawlessly between the three languages, though you have to be good with sub-titles. I was amused at the audience make-up. Save 3-5 folks, everyone there was Jewish. Cleveland has a thriving Jewish population, but no real movies in Hebrew, which is what we assumed got them in the door - not the gay stuff. For a little promoted movie, the place was full, which was nice to see. I thoroughly enjoyed the Cakemaker and would recommend it if you all have the opportunity to see it.